Heavy favorite Shared Belief will carry 125 pounds in the "Big 'Cap"
Sunshine burst through a powder blue sky in all nature's glory at Santa Anita Sunday morning, basking in the afterglow of a day that lived up to its script. The only thing missing was a rainbow. But for Team Hollendorfer, it was business as usual after recording one of their most memorable victories, Shared Belief's 1 ½-length triumph in the San Antonio Invitational over Horse of the Year California Chrome in a race that will be indelibly ensconced in the minds of the 21,522 fans who ignored intermittent light rain at The Great Race Place, in addition to legions who watched on TV and on-line. Thankfully, this was not Deflategate. For once the air didn't fizzle from a storyline artfully crafted by the racing gods. “Shared Belief was excellent this morning,” Ward said. “He ate all his feed. What happened in the past is not important. The only thing is the future, and that would include the Santa Anita Handicap (on March 7). Ward, who spent 22 years with the late Bobby Frankel before joining Hollendorfer for the past eight, is a behind-the-scenes guy reluctant to pat himself on the back, but an integral member of the vastly successful team. “I appreciate that Jerry gives me a lot of freedom and a lot of opportunities . . . They turn out to be good horses if you give them a chance,” said Ward, who will be at Laurel Saturday to saddle Grade I La Brea winner Sam's Sister in the Barbara Fritchie Handicap. California Chrome, meanwhile, took the first stage out of Dodge, leaving early last evening for his Los Alamitos headquarters where he will prepare for the $10 million Dubai World Cup on March 28. Whether the two champions meet again on the race track remains to be seen, but for the immediate future, that won't happen. Shared Belief is headed for the Santa Anita Handicap, while California Chrome will embark for the Middle East. 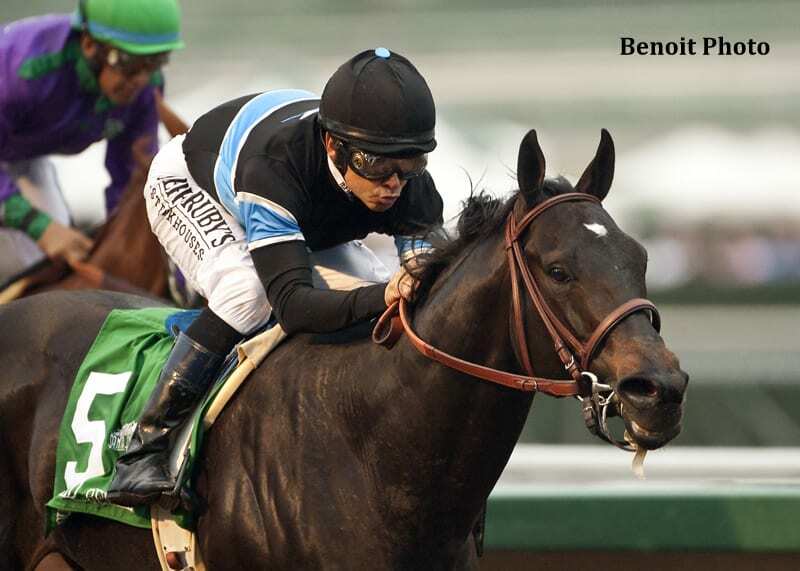 “It was a good race for the fans,” said Mike Smith, who once again authored a Hall of Fame ride aboard Shared Belief. “It's going to be a great rivalry. It's great for racing and hopefully they'll get a chance to meet a few more times. Fair enough. But will it be Ali-Frazier? Wilt versus Russell? Affirmed-Alydar? This entry was posted in Racing and tagged California Chrome, dubai world cup, Horse Racing, Paulick Report, san antonio invitational, santa anita handicap, santa anita park, shared belief, thoroughbred by Ed Golden/Santa Anita. Bookmark the permalink.